Before each U.S. election, I hold a Peace Meditation in my home for several friends. It is always a special time when we hold a powerful intention for the highest good and best possible outcome for our country. This year was especially important because the election “season” was so contentious. 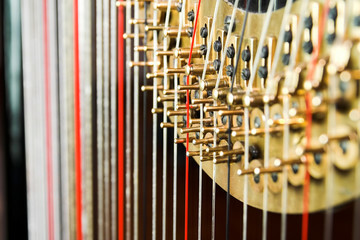 In preparation, I had to replace a couple strings on my pedal harp before the gathering. One was a very long red string (lower octave). You draw your own conclusions … !